It is not every day that a hit Broadway musical comes to town, but that is the treat awaiting audiences at the Volksoper Vienna. Man of La Mancha was written by Dale Wasserman, the American playwright who adapted Ken Kesey’s groundbreaking novel, One Flew Over the Cuckoo’s Nest, for the stage; the music and lyrics were provided by Mitch Leigh and Joe Darion, including the much-recorded chart hit The Impossible Dream. After being previewed in Connecticut, Man of La Mancha received its premiere at the ANTA Washington Square Theatre in New York’s Greenwich Village on 22 November 1965. It transferred to Broadway on 20 March 1968, starting with the Martin Beck Theatre before playing at the Eden Theatre and finally the Mark Hellinger Theatre. In total, the original run of the musical lasted for over six years and more than two thousand performances. The opening scene of the musical finds Cervantes in prison and about to be put on trial by the Spanish Inquisition. Desperate to rescue the first manuscript of his yet to be published Don Quixote from the clutches of his fellow prisoners, he offers up a play based on the novel, with Cervantes himself taking on the role of the delusional Alonso Quijana whose head has been turned by reading too many tales of heroic chivalry. Wasserman’s clever device of placing his protagonist in an imaginary world, worthy of Cervantes himself, unleashes a series of fantastic adventures drawn from the novel, brought to life by Leigh and Darion’s wonderful songwriting. 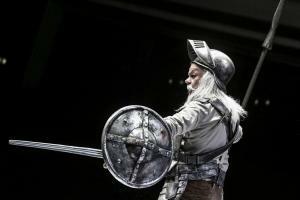 In the original novel, we are moved to pity Quixote who has lost touch with reality altogether; the musical, which is wonderfully uplifting, provides a different spin on the story with Cervantes giving his cellmates the chance, even if only for a while, to escape the quite awful circumstances they find themselves in. The success of the musical led to the 1972 film of the same name starring no less than Peter O’Toole in the central role of Cervantes and Quixote. Now, with the musical celebrating its golden anniversary, it is the turn of Robert Meyer, Artistic Director of the Volksoper Vienna, to fill the shoes of the Man of La Mancha.